Nassir Abdulaziz Al-Nasser was elected President of the United Nations General Assembly’s 66th session on 22 June 2011. At the time of his election, he had the rank of Minister, granted by His Highness the Emir of the State of Qatar. 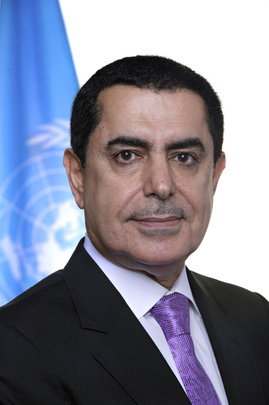 Mr. Nassir Abdulaziz Al-Nasser presided the General Assembly’s 66th session from 13 September 2011 to 14 September 2012.
the five permanent members of the Security Council: China, France, Russian Federation, United Kingdom and the United States. Accepting the post with “great honour,” Mr. Al-Nasser said he was becoming President at a time when the world is facing “enormous political, social, economic and environmental challenges". “Not a month goes by that we do not hear about a natural or a man-made disaster and the subsequent food, security, health and education crises that follow inevitably. At the same time, there are still people who are living under occupation and oppression, who are yearning for freedom and dignity,” he added. The President-elect has proposed that “the role of mediation in the settlement of disputes by peaceful means” serve as the theme for the high-level debate slated to be held at the opening of the Assembly’s next session. He pledged also to try to work as a bridge between countries rich and poor to help build consensus on key issues such as hunger, poverty, terrorism and climate change. 22 June 2011 - General Assembly's 104th plenary meeting: Election of the President of the General Assembly for the 66th session.